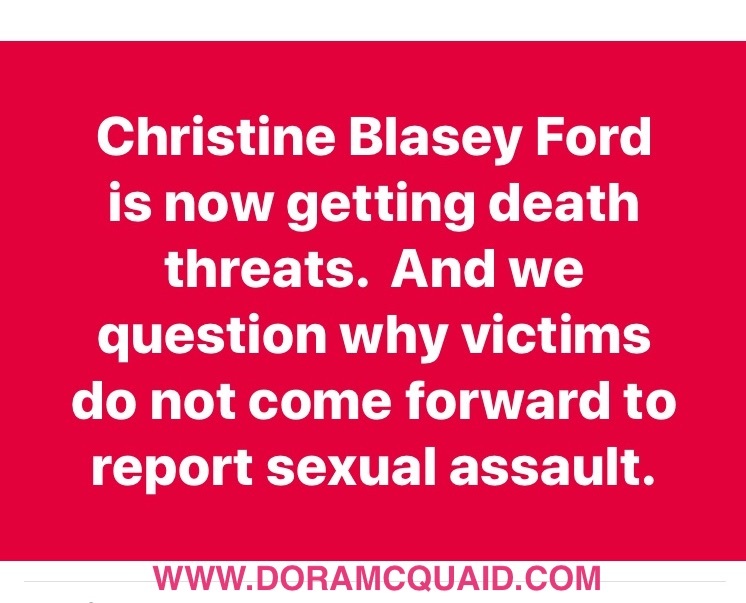 Dr. Christine Blasey Ford, the woman who came forward and accused Brett Supreme Court nominee Brett Kavanaugh of sexual assault, has been forced to leave her home as a result of death threats since her story went public without her consent on Sunday September 16, 2018. Dr. Blasey-Ford alleged that Brett Kavanaugh sexually assaulted her in high school during a party in the early 1980s, when he pushed her into a bedroom, attempted to remove her clothes and covered her mouth until another male classmate separated Blasey-Ford and Kavanaugh. Kavanaugh has categorically denied these allegations since this story broke and, in the meantime, Dr. Blasey-Ford’s life has been endangered by her willingness to come forward with her experience of Kavanaugh in an attempt to share her experience before Kavanaugh is confirmed as a Supreme Court Justice. And we wonder why victims of sexual assault, especially victims of childhood sexual assault, are hesitant to report their experiences. All peace to each one of you, especially those of you who are survivors of childhood sexual assault.